You are here: Home > Blog > Flora & Fauna > Green Burial – can I be buried in my woodland? 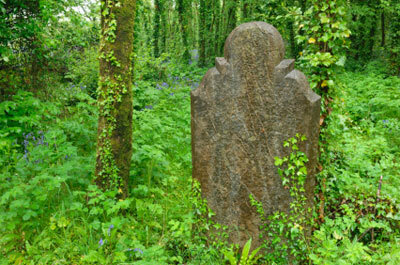 “Green burials” of various sorts are increasingly popular - many people want to escape from what they perceive to be the conveyor-belt experience of some crematoria and the impersonality of cemeteries and churchyards. Many people also find established funeral rituals are not right for them. More positively, woodland burials or green burials are seen as friendlier to the environment and more natural than cremations.So, if you have your own woodland and you plan to keep ownership in the family, requesting to be buried in the woods can be very appealing. What are the practicalities of a green burial? • The site should be more than 30 metres from any spring or any running or standing water. It should also be more than 10 metres from any ‘dry’ ditch or field drain. • The site should be at least 50 metres away from any well, borehole or spring that supplies water for any use. If you are not sure where these are, our local office will be able to advise you. • When preparing the grave, make sure there is no standing water when it is first dug and that the grave is not dug in very sandy soil. • There should be at least one metre of soil above and below the body after burial. If you are burying a body, rather than burying ashes from a crematorium, the hole you dig needs to be quite deep.Ideally it should be two metres, which will take quite a while to dig – you probably need to leave at least half a day.You can alternatively use a mini-digger. Do I need special permission for a green burial? You do need permission from the owner of the land, but you don’t need to obtain planning permission or to contact the local Environmental Health Officer or the Department of Health or the Environment Agency. Where can I put a grave? You should be practical in deciding where you want to dig the grave – sandy soils can be dangerous to dig to any depth and you probably don’t want any live burials! Rock is obviously a problem and digging too near to big trees will be difficult because of their roots. Many people find that being so much involved in the practicalities helps with the grieving process. It is advisable to keep a good record of where the burial site is located and keep the record with the paperwork for the property.Many people like to plant a memorial tree next to the grave, which is also a good way to record where the body is. How much does a green burial cost? Green burials vary enormously in cost - from about £200 to about £2,000, but the average cost is about £700. What should you put the body in?You can use a traditional coffin which a few undertakers will sell direct to you or you can buy a cardboard coffin for about £60- £90, but many people like willow coffins.These can be found by googling “willow coffins”, and cost about £450 to £550.Bamboo coffins are also available. Of course, these alternatives can also be used for a more traditional funeral. You may find that in exploring beyond the standard options of cremation or burial in a cemetery or churchyard, many people will try to talk you out of the alternatives, but there is a trend towards publicly available green burials as the following figures demonstrate. Today there are about 200 green burial sites, ten years ago there were only 50, and twenty-five years ago only one such site. Of these sites well over half are run by local authorities, a few by charities and about 60 by farmers or businesses. Have you buried a relative or friend in a green burial? We’d be interested to hear your experiences. Have you any questions or comments to add below? My husband and I wish to be cremated and have a Woodland burial in North Yorkshire, how and who would cremate us please? When my husband and I pass away, we have choosen to be cremated and wish for a natural burial. How and who cremates us? My father died in 2007. He knew he was dyeing and found a NBG in Wales Coed Bell Cemetery where he wanted to be interned he bought a plot for three burials and my mother joined him there in 2012. I also buried my father’s Uncle there too, because he was not married and had no surviving siblings or children of his own, and was very close to my side of the family. The sight of the NBG is at the top of a hill between cemetery and the blue bell woodland it will be part of the woodland in time and we chose a tree to place on the graves that will become a part of the wider woodland. It is a lovely place to visit and walk. I hope to go one step further when my own time comes,I would like to be buried on my own land and I’m looking at doing that. Regarding the natural woodland valley near to Durham City, I am informed that anyone interested in this location will be suitably advised and assisted. My sister-in-law would like to plant/purchase a tree in Memory of her late husband and would like to somehow mark the tree as a recorded memorial. If so, are there any suitable sites within easy travel distance of Swansea as she would like to visit on occasions. Does anyone know of a woodland site near Mayfield, East Sussex that would accept the burial (not scattering please) of cremated ashes? Sorry, my website was not included in comment above. Would also like to inform people of my burial ground in Devon. The closest woodland Burial to Dartmoor, near Okehampton. At present it is a young plantation set within a 6 acre location. Views to Dartmoor and directly west so a good sunset can be had. A great article,one word on the coffins,the trade is inundated with imported willow coffins,also bamboo,banana leaf sea grass ect. all sold under the green,eco banner. they are shipped in containers. How green can this be? Make sure you choose a coffin that really is green and make locally if possible.The Good Funeral Guide website has good info. Also http://www.weavermanbaskets.co.uk ..Here you can help make you own . Gary, if you want any info email me on the above address. Hi I own my own woodland in Hertfordshire which is surrounded by fields and breathtaking views across the countryside ,which i would like to be a natural green burial site . I would be very grateful of any advice that any one can give me/ has already obtained planning permission ,or seeking planning permission or anyone has any advice .on what steps I need to take regarding planning .I spoke with one of the local planning officers and he wasn’t quite sure on what advice to give me . I understand you need to take the water table into account ,and it has to have no impact or disturbance on the natural land scape . I was so upset when i came on this site, because we have just lost a dear friend, She is to be buried at home on her own land. You have helped to make it all so nice. Thank you.